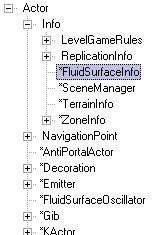 Document Summary: A guide and reference to setting up Fluid Surface Infos. Document Changelog: Last Edited by James Golding. Build 927 has a simple fluid-surface grid simulator effect. This is a brief overview of how to use it. Here is an overview of what all those options mean. Some are explained in more detail later. AlphaCurveScale Ratio between curvature of fluid at vertex, and resultant alpha at that vertex. AlphaHeightScale Ratio between height of fluid at vertex, and resultant alpha at that vertex. Summed with alpha due to curvature. AlphaMax Maximum alpha of fluid vertex. bShowBoundingBox Display bounding box of water. ClampTerrain Terrain to check against when 'clamping' fluid vertices. FluidDamping How quickly waves die away. Keep between 0 and 1. FluidGridSpacing Distance between fluid vertices. Changes surface size, without changing number of verts. FluidGridType FGT_Hexagonal or FGT_Square. Hex looks better, but is slightly slower. FluidHeightScale Final scaling factor for wave heights. FluidNoiseFrequency Number of randomly-place noise plings produced per second. Try around 50. FluidNoiseStrength Distribution of strength of noise plings. FluidSpeed Speed of waves travelling across water. Reduce this to make fluid more viscose etc. FluidXSize Number of vertices in X direction. Should be power of 2, no greater than 256. FluidYSize Number of vertices in Y direction. Should be power of 2, no greater than 256. OrientShootEffect When spawning ShootEffect, orient in direction of shot. OrientTouchEffect When spawning TouchEffect, orient in direction of touch actor velocity. RippleVelocityFactor Ratio between speed of actor moving through water, and strength of ripples created. ShootEffect Effect to spawn when fluid surface it shot. ShootStrength Strength of pling when water is shot. TestRipple Turn on ripple that moves around pool (in Editor only) to let you see how water looks. TestRippleRadius Radius of test ripple. TestRippleSpeed How fast test ripple moves around surface. TestRippleStrength How strong the test ripple is. TouchEffect Effect to spawn when fluid surface is touched by another actor. TouchStrength Strength of pling generated when actor first touches water. UOffset Texture co-ordinate offset in X direction. UpdateRate Rate at which fluid surface simulation is updated. Increase if fluid surface seems jerky. Usually no more than 60Hz is required. UTiles Number of times to repeat texture in X direction. VOffset Texture co-ordinate offset in Y direction. VTiles Number of times to repeat texture in Y direction. WarmUpTime Amount of time (in seconds) to run water for to build up noise etc. when water is first started. Usually a couple of seconds. 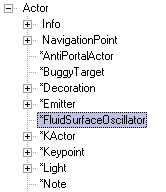 To set the material to use for the fluid surfacem under Display add your material as element 0 of the Skins array. FluidInfo FluidSurfaceInfo to add waves to. Frequency Frequency (in revolutions per second) of oscillator. Phase Allows you to offset phase of different oscillators. Radius Radius of fluid to affect. Strength How large the waves are. As you can see in the picture above, the waves from the oscillator pass right through the bit of raised terrain. This isn't very realistic. Waves will also not bounce off the actual boundaries of your pool. 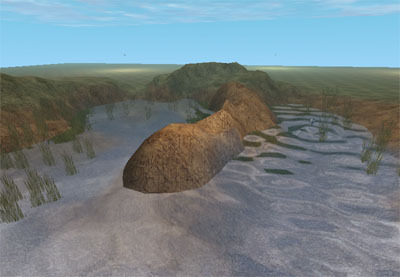 To fix this, we use the 'ClampTerrain' property of the FluidSurfaceInfo. 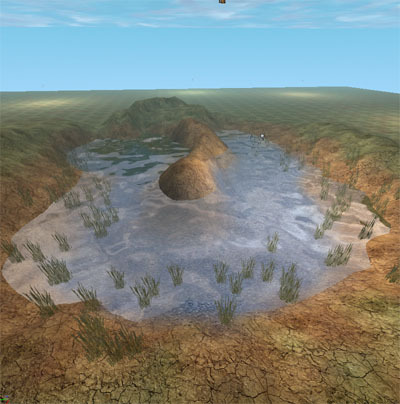 Got to the fluid surface properties, click on ClampTerrain, click Find and then click on the terrain surrounding the fluid. Then do a Rebuild All to get the water to update its 'clamped' information. The fluid surface will clamp to zero any vertices that are underneath the terrain you specify, or are inside blocking volumes. This stops waves passing through those vertices, and they will reflect off instead. Note how the waves don't pass through the raised land. Note: you will have to rebuild the clamping information if you change the fluids size/location etc. You can use this alpha to, for example, blend on a frothy texture where the water has most waves. The easiest way to create a hole in a rectangular fluid surface is to use a material with a specific opacity mask. You can also use this to fade out the water at the edges of your pool. 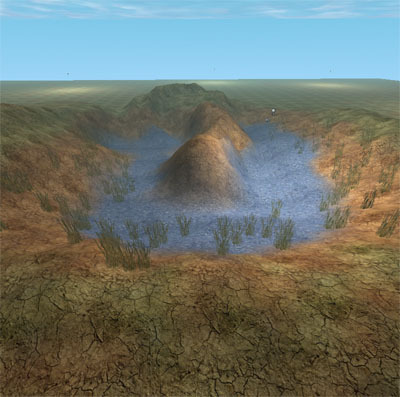 See the pool of water in the UT2003 map DM-Antalus for an example. There are two ways in which other actors in the game can interact with the fluid in-game. Shooting. 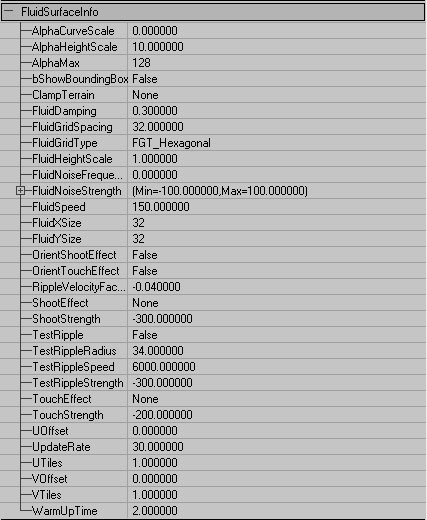 By default, ripples are spawned with the strength specified in ShootStrength at the point where the shot hit. An effect of the class specified in ShootEffect can be spawned at that location as well. Toucing. For an Actor to cause ripples in the water by touching it, it's bDisturbFluidSurface flag must be set to true. The actor creates an initial ripple at the point where it first touches the water (TouchStrength/Effect specified in the same way as ShootStrength/Effect). 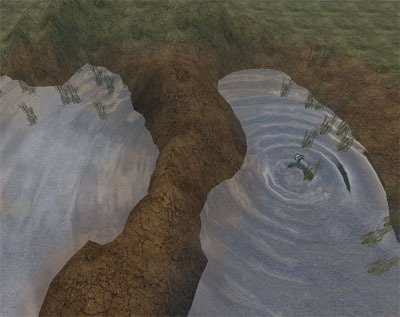 Then, ripples are generated based on how fast the actor is moving through the water. RippleVelocityFactor is used to adjust the ratio between horizontal velocity of actor, and strength of ripples. The radius of the ripple created is taken from the collision radius of the actor. Note that fluid surfaces have no affect on the physics of an actor. If you want things to float etc, you will have to use a WaterVolume as well.